With the recent rioting in London, could the timing for a TV special from Banksy be any better or worse? Charting the history of public disorder, Channel 4 will be showing “The Antics Roadshow” this Saturday at 10.45pm. The show is an hour-long special produced by Banksy charting the history of behaving badly in public, from anarchists and activists to attention seeking eccentrics. Contributors include Michael Fagan talking about breaking into the Queen’s bedroom: ‘I looked into her eyes, they were dark’; and Noel Godin, who pioneered attacking celebrities with custard pies: ‘Instead of a bullet I give them a cake’. Banksy explains his reasoning behind the show: ‘Basically I just thought it was a good name for a TV programme and I’ve been working back from there’. 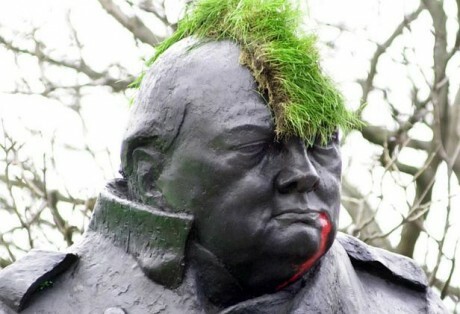 The show is also rumoured to include a world exclusive interview with the man responsible for putting the turf Mohican on Winston Churchill’s head. great! showing on channel 4 after our week of anarchy in England was a great idea! I love that he thought of the name of the program first and worked from there! Does anyone know the name of the Russian song playing during the Voina art collective bit? I did not think it was possible for Banksy to be any more brilliant and then he comes up with a creative idea like “The Antics Roadshow”. This is my first time hearing about this TV special and the fact that Banksy is going to produce it himself is simply genius. I respect Banksy as an artist and now he is almost an artistic business man, so to speak. Without the money making factor, Banksy is able to entertain media consumers in multiple ways. Through his stencil graffiti street art, to a TV show, Banksy continues to tickle the audience’s fancy. I don’t know very much about Michael Fagan but I am definitely intrigued about seeing his input in “The Antics Roadshow”. Where is Michael Fagan based out of and what type of art does he produce?